With our team you can get the office you want. An initial design consult is a detailed discussion of your ideas. You set the agenda. Jim comes prepared to answer questions such as: what size should it be, how long does it take, how much will it cost? If you have a site plan or floor plan, he evaluates function and code compliance. If you prefer to focus on the big picture, talk about a vision for your practice, Jim will respond with ways to translate that vision into reality. Your description of specific requirements and general goals is where Jim starts to define three components of a successful project. A customized package of services and fees based on your needs follows the initial design consult. Where the scope of our work is well-defined, we offer fixed fees. Where the scope is not readily defined, we offer a range derived from comparable projects. Our fee structure is based on the way we want to buy professional services. 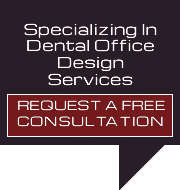 Designing a dental office plan that works for you is our first step. A plan should do more than fit rooms to available space. Your plan should fit the way you want to practice. We can show you what other dentists have done so you avoid “reinventing the wheel”. Dental office plans that seem to work on paper can be awkward when built. Our plans work in all three dimensions. You can see the results in our photographs.